Is Marcus Smart crazy, or does he have an intense fire to compete? I often get ideas from our knowledgeable readers, and this one came from Randall. In my CelticsLife article about the Red Claws trading for Anthony Bennett, Randall commented "You either have the fire or you don't", indicating that Bennett may never have it. Well, Marcus Smart has the fire, and at times, it looks like napalm has just been unloaded on the court. The NBA has reviewed the two offensive fouls called on James Harden and determined the referees made the correct call on each play. Here is ESPN's Tim McMahon on the decision. 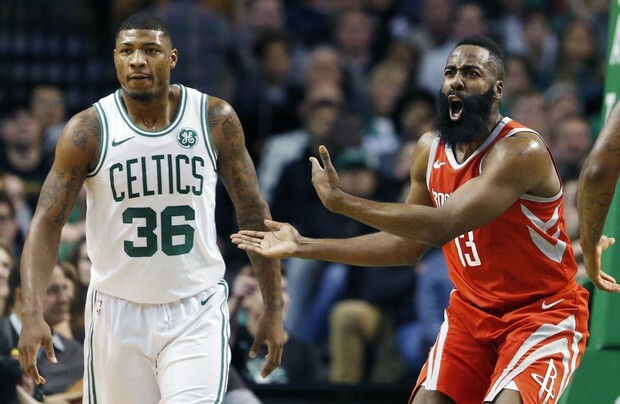 The NBA's last-two-minute report confirmed that the offensive fouls drawn by Boston's Marcus Smart against Houston's James Harden late in the Celtics' comeback win Thursday night were correct calls but identified uncalled travels before Boston's final two baskets. Overall, Olowokandi's professional career was remarkably underwhelming and he has repeatedly been named among the biggest disappointments in NBA history. The Clippers' pick of Olowokandi was particularly unwise as the 1998 NBA draft produced players such as Dirk Nowitzki, Paul Pierce, Vince Carter, Antawn Jamison, Rashard Lewis, and Mike Bibby, all of whom went on to have exceedingly more successful careers than Olowokandi. Bigs can make it in the NBA on size and talent alone. Smaller players need a love of the game and the fire to compete at a high level of intensity to make an impact. Dirk had the fire, won a Championship and is still playing. Pierce had it, and I believe he could still play in the NBA in a limited capacity. But I can't recall a player recently with the fiery determination of Marcus Smart. "Man, that just shows how crazy he is," said teammate Terry Rozier, who had 13 points, many of them big ones. "A guy like that, it's not the first time I've seen him do things like that. But like I said, he's crazy. You need a crazy guy like that." Terry's right. Every team needs a guy like that. I loved replaying the offensive-foul video, and I love writing about Marcus Smart. He is quiet and humble. He never praises himself and does his communication on the court. As some of our CelticsLife readers have indicated, Smart's poor shooting may result from his difficulty in transitioning from intense defense to controlled offense. Let me make the Marcus Smart/Chauncey Billups comparison again. Billups became known as Mister Big Shot despite shooting a career 41.5% on field goals. In his first four years in the League, he averaged 36.5%. Now in his fourth season, Marcus is averaging a career 35.5%. He just needs to get to 40%. No, Marcus is not crazy. It just seems like he is. Ask James Harden. In a loss to the Wizards last night, James had a career-low 20 points and zero rebounds. Marcus might still be in his head.